From the opening, fanfare-like Vivace, Matsuev was in complete control, and used his instrument’s full range in the extensive cadenza (a recollection of the movement’s themes), which made the nocturne-like Andante cantabile second movement all the more effective as he demonstrated wonderfully reflective playing. Youthful vivacity prevailed in the final sonata-rondo movement Allegro vivace, with soloist and orchestra as one under Järvi. Rachmaninov’s enduringly popular Piano Concerto No 2 in C minor needs little introduction. 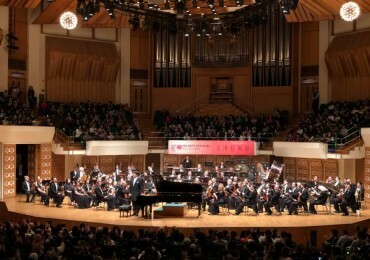 Issues with the Cultural Centre’s acoustic left the cellos sounding too thin and distant, but the Moderato first movement, with Matsuev’s opening bell-like chords aptly setting the scene, was given a robust performance by both orchestra and soloist. The Adagio sostenuto second movement opening was suitably dreamy, with the superb clarinet solo gently unfolding the much-loved melody. Beautifully intertwining the piano’s own version, Matsuev then gracefully transitioned to the agitated first theme of the final Allegro scherzando.